ELECTRIC GOLF TROLLEY SPARES, PARTS. PARTS, SPARES ALL TROLLEYS, LYNX GT, TopCart, HILLBILLY, Motocaddy, POWAKADDY, TROOPER ETC. Click on your trolley make from the list below. Caddiemaster, Power Pro, Precision, Pro-Master, GTE-08, Linden, others. Chinese RIPU golf trolley spares. G-TECH GOLF. Parts & G-TECH TROLLEYS. Hillbilly Electric Golf Trolleys. All Terrain and Compact. E-Caddy, Stowamatic, see SLAZENGER GOLF. PARTS & SPARES FOR Hillbilly, Motocaddy S1, TROOPER GOLF TROLLEYS, T5-T6-T7-T8. Motocaddy S1 & S3, Hillbilly (PCB, print plant, circuit board,) potentiometers, switches and electricals, special requirements if not listed ie VDC, please ask if it is availablefor and for the price. 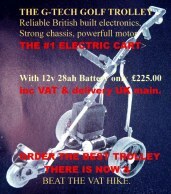 to suit Hillbilly, Fraser and many electric golf carts, buggys and golf trolleys. Motokaddy, G-Tec, Trooper, Pro Kaddi, Kaddimatic, Ultrakaddy, etc. Same day ship by first class post, couriers or recorded delivery. HILLBILLY GOLF SPARES & PARTS. If you can't see what you are after please ask. Please pay via secure payment terminal, or if prefered by cheque, transfer etc. WWW. sites are not secure sites! EU Prices are now higher due to increses in misplaced items,Germany, Spain, Portugal, etc. For a complete range of batteries to suit all golf trolleys and mobility vehicles.